Lake’s Five is a creation of Elk Studios, a software development company known for producing really great video slots for players. 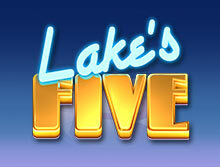 Lake’s Five is also a great video slot game which consists of a total of 178 paylines. The slot has a total of 5 reels. Lake’s Five is inspired from a fan-favorite Hollywood Movie, Ocean’s Eleven. The George Clooney starring film has had many video slots created after it. Lake’s Five is built on similar line but has a very interesting twist. As you start spinning the adventurous reels of Lake’s Five, you will become a part of Lake’s heist. You will become a part of Lake and his crew of 5 members. This game has really nice graphics with quirks which will make you remain gripped to the game. Lake’s Five with its pretty interesting gameplay and graphics, lands at a very favorable position for the casino game players. It has a lot of bonuses up for grabs. It, however, lacks in the department of RTP. It has a low “Return to Player” factor of 96.3% which can definitely be improved upon. Its Jackpot is also placed at a 1000 coin size. So, Lake’s Five does lack in its ‘maximum win’ department also. To play Lake’s Five, the minimum wager you can place is 0.02 size of the coin which can go as high as 100 sizes of the coin. You can start this game from an amount of 20p which can go up to £100 per spin. It shouldn't come as a surprise if we tell you that Lake’s Five has pretty stunning graphics. In fact, every game of Elk Studios is blessed with a great outlook and pretty feature. Lake’s Five is based upon a heist adventure; hence the symbols will resonate with the theme. The game has a backdrop of Mr Romano’s massive tower. Along with this, the symbols of the reel are: bowls filled with diamond, medical bags, the 6 companions of Mr Lake - Monkey, Goldfish, Elephant, Goldfish, Alligator, and Parrot. The character of Goldfish is highly rewarding. Combos across 5 payline from it can yield you a pay-out which will be 50 times higher than your stake. Mr. Lake is also an important and lucrative symbol. His symbol acts as a wild and replaces all the rest of the symbols which are present at the bar. The game follows the story of Mr. Lake as he attempts to take Mr. Romano with his crew. Mr Romano supports illegal trading of rare species of animals in order to turn his life around and make a fortune. Elk Studios has made sure to feed its players with a massive back-story so as to keep it entertaining. The game offers several great features which will be discussed in the following sections. Mr Lake: Mr Lake, as mentioned above acts as a Scatter symbol in this video slot game. If you are able to get 2 symbols of Mr Lake on your reel then you will be able to trigger a wild feature. This wild feature enables Re-spins in your game. When it is triggered, it turns the Scatters into Wilds. Heist Bonus: The Heist Bonus can be triggered when you are able to land 3 Scatters. These scatters when turn into Gold Keys, you will get your Heist Bonus round. When this round begins, you will avail ten free spins. And with every subsequent Gold Key, you will be able to avail 1 additional spin. The Heist Bonus round feature in which you can accumulate golden keys to unlock an even bigger prize which is the cascading wild features. This will help you land more free spins. Other features in this game include a multiplier wild, Walking Wild, Climbing Wild, and Stick Wild. The Walking, Climbing, and Sticky Wild are triggered when 3 keys get collected on reel 1/3/5. The Walking Wild shifts towards right on the reel with every subsequent spin while Sticky Wild remains constant for the coming spins and Climbing Wild shift in an upward direction after every spin. 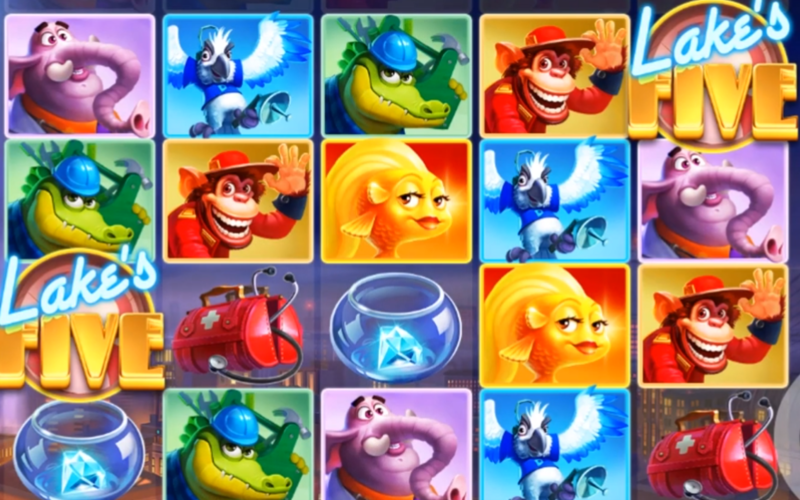 Lake’s Five is a nice lighthearted video slot game which is perfect for gamblers who are looking for a little gambling action on the side. Much like all good video slots, Lake’s five is also compatible with all of your devices. You can play it on your smartphone, tablet, and PC. You can even run it on different software seamlessly. The game has a low RTP which deducts its points but with its nice features, the game becomes a good package. It doesn't have a volatile variance so you can play and tread as you like.